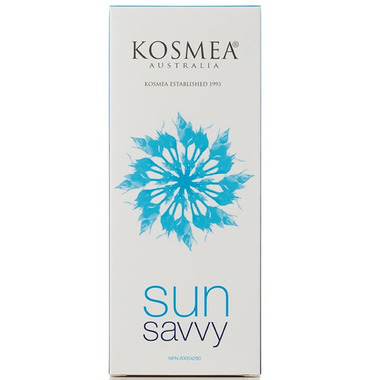 Be Sun Savvy all year round with Kosmea nourishing SPF30 and Rose Hip Oil duo. Protect skin with SPF30 Moisturizing Lotion and Repair skin with the world’s finest Certified Organic Rose Hip Oil 10mL as a gift with purchase in a beautifully packaged box. Kosmea broad-spectrum tinted moisturiser all-natural sunscreen containing a unique blend of delicately scented essential oils. The light non-greasy formula provides a highly effective shield against skin damaging UV rays using naturally derived zinc oxide, making it an ideal choice for even the most sensitive skin types. Apply liberally/generously (and evenly), 15minutes before sun exposure. Reapply at least every 2 hours or more and after swimming or towelling, perspiring and washing. Medicinal Ingredient: Zinc Oxide 20%w/w Non-Medicinal Ingredients: Aqua, Caprylic/capric triglyceride, Caprylyl Glycol, Cerearyl Alcohol, Hydroxypropyl starch phosphate, Phenethyl alcohol, Sorbitan stearate, Boswellia, cateril oil, Cetearyl glucoside, Citrus sinensis Peel Essential Oil, Lavender Essential Oil, Pelagonium, graveolens Flower oil, Polyhydroxystearic Acid, Rosa canina Seed Extract, Sucrose cocoate, Xantham Gum, Aloe barbadensis leaf extract, Cameillia sinensis Leaf Extract, Carthamus tinctorius (Safflower) Seed Oil, Cucumis sativus (Cucumber) Fruit Extract, Glycerin, Isoamyl laurate, Rosa canina Fruit Oil, Citric Acid. A specialist skin care oil, Kosmea’s 100% Certified Organic Rose Hip Oil is sourced from the mountains of Lesotho, South Africa and is the worlds original and finest Certified Organic Rose Hip Oil. I purchased this sunscreen for the first time and love it. I will definitely repurchase it. Pleasant non-greasy, light mousse-like texture. Interesting scent out of the tube that goes away quickly, but I found I actually like it. I've purchased many different sunscreens over the years, and so far, I like this one the best. My favorite sunscreen- I repurchased it multiple times. I have sensitive melasma prone skin and this sunscreen protects it well without being greasy. Another great product from Kosmea! Great day moisturizer with SPF. My sensitive skin loves this stuff.